Today I share with you the Swan Blessing story received by hair weaver and colour alchemist, Roxie Jane Hunt. It is a beautiful ancestral vision and journey she received during her Swan Blessing of the tale of the spinner that wove the cloak that kept the village warm but became the cloak of invisibility. When I see Roxie’s intricately woven hair creations I am always reminded of the weavers and the spinners of the past. Hair is such a magical fibre it is our wool, our human fiber and antennae to the cosmos. It is also one of the strongest holders of our DNA and secrets and gifts of our lineage. I am honoured to share Roxie’s story and to know her work of wisdom, devotion and dedication to creating community through ritual hair care and adornment. For all those who need help to throw off the cloak of invisibility and shine again. 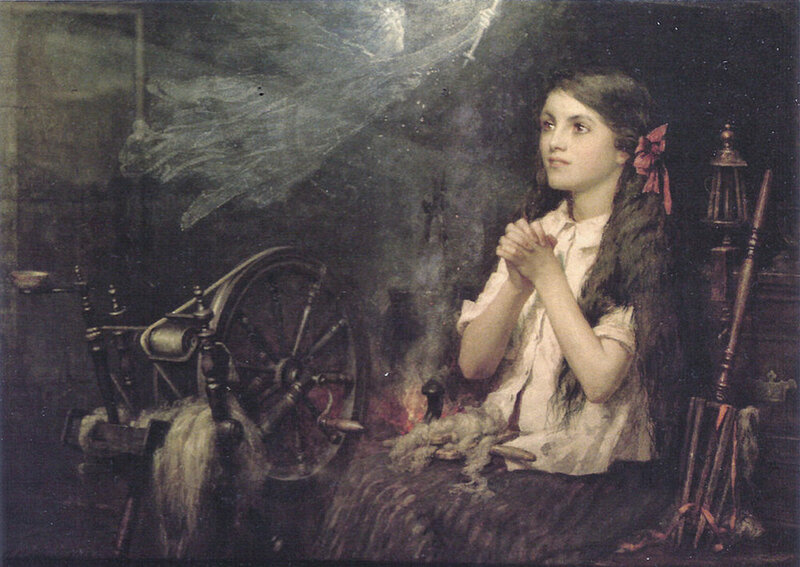 A woman sits at her spinning wheel on a crag above the ocean, watching the light dance on water as the fingers of her hands spun wool. In this state, she prayed. This was her devotion. When the sun was high in the sky, and the rain slowed to allow for a breakaway ray to hit the sea and light her eyes on fire, she composed herself, and retreated inside to her kitchen, where the colors and flavors of ingredients foraged from the land and sea awaited her, beckoned her in to begin her second devotional act of the day, the Alchemy of Supper. She was a solitary woman, happy that way. But everyone who came to visit her to inquire about a cloak was fed a meal by her and soon became a friend for life because she was unforgettable. She was not like the other women in the village. She was humble and kind, shy but with a wonderfully dark sense of humor. But she was also wild, and no one doubted or questioned that. She wanted it to stay that way. Her days were mostly the same, and time didn't matter. Only the seasons and the ebbs and flows of the moon, kept her to rhythm. Sometimes she dove into the sea. Some times she ran along the shore. Sometimes she stayed in her home, like a bear in a cave. Happy in the dark, trusting the light would return. One day, the nearby village was set on fire by invaders from a different land, who had come to spread the word of a new devotion. She could smell the smoke and the fear. She felt afraid that she would lose her freedom to her own inner wild, a freedom she would protect with her life and all she had. When they came for her, she had already left, crawling through the thickets of the Scottish highlands with nothing but her cloak which was so big and enveloping that she disappeared inside it. They set her home on fire, and her spinning wheel. She knew it without knowing it. She knew she could never go back. She spent the rest of her life hiding who she was, in fear of persecution. She clung to her wild nature, kept it locked inside her, wrapped up in her cloak of invisibility. Never again would she pray to the wool with which she spun in devotion, Never again would she offer her creations to the people that she loved to keep them warm and protected. Her own protection became her armor, and inside she turned to ice. What is wildness if it is held too tightly? What happens to a heart of ice? When the swan came, she was still wandering. An old, old woman, frozen with sadness. We took her to the waters edge, the swan and eye, and we asked for the help of all our guides and ancestors to bring this woman back to joy. Her grandmother came, emerged from the sea. Same blue eyes that showed of a life of laughter snuffed out too soon, turned to ice. She was ancient as the cliffs and wrapped in seaweed, We cut her loose, unbound her arms and her throat and her stomach where the kelp had wrapped itself around her, enveloping her and dragging her deep into the inky water. She took her granddaughter’s face in her hands and said, "Be free, child. You are released as I am released" and the woman removed her cloak, took her grandmother’s hand and together they transformed into wild geese, graceful feathered wings, warm blood and dark eyes they took to the sky, following the swan towards the horizon. Today I share Hollie's Swan Blessing story of the Vow to Forever Fight and how she released herself from this old vow of her lineage. Warrior's oaths such as this carried out of time can create a sense of heavy responsibility in our present lives often for situations and events that we cannot control. These types of soul vows also carry a fierce need to defend and protect the lives of the people we love and even whole communities that we hold dear, while the integrity of these feelings is beautiful what this can create is a need to be 'ready for battle' at all times and a lifetime 'at war' which is exhausting. I was honoured to hold this Swan Blessing session for Hollie who has such integrity in her work and path teaching young women and girls the cycles nature and magic. She is someone who has walked her talk for many many years. I love the photo below of Hollie with her bow and arrow on her land where she lives off-grid with her family. This is a beautiful image of embodied ancestral wisdom. To release the vow to forever fight has released Hollie from a responsibility that would have been impossible for one person to ever carry so that she can now continue her work helping and speaking up for others with a new relationship to herself, community while feeling the joy of living in the garden of our Mother Earth. "I met/merged/revisited/became an Ancestor Woman at the time of the first Roman invasions to Britain-Brigga. In a round hut with an earth floor, there was a man, a beloved, dying from wounds from a battle where many lives had been lost. There were hounds in the hut, of course there were hounds. And there were women gathering with children. In the moment of the beloved's death, in the fear of losing tribe and land, my Ancestor Woman vowed to forever fight for the next seven generations, to keep them safe, to guard their power, and to ensure that no 'other' force took their freedom. The gathered women would keep the next generations safe by separating – going it alone; each taking a group of young people to disappear into the forest, join with other tribes, save what can be saved, even if it meant being alone. A deep wound was torn in leaving the land of our ancestors, but a new promise was held in the potential for a future that kept the children safe. I saw the Ancestor Woman partaking in various teaching activities. She crossed many tribes/cultures. I was aware of power-full healing modalities, plant magick and the creation of hand crafted, woven creatures that could hold medicine. The Ancestor Woman travelled many places, taught skills to many people, with faces different form her own. I recognised her ability to heal in ways that didn't need explanation. She had unique techniques and she engaged her Self as a process of the work. And yet, releasing the binds of the Ancestor Woman's vow allowed me to shift from creating the pattern to supporting the need. Cutting the threads released the pressure of having to fight, to supporting a process. Although the Ancestor Woman was successful at providing/supporting/saving the next seven generations, her greater body of work, and that which was the largest gift to the world, was actually that which could not be named – her expert Self. It has been some time since I had my Swan session with Julia. Writing usually comes easy to me, yet I could not write this piece. More recently I entered a vision and to my surprise, the story picked up at the place where the Swan left off. The Ancestor Woman was in the field, with the many plants, and indeed she was dying. She was there, in the place of plants to leave her wisdom for the next generations. She passed her healing to the plants, and the message was clear : Tend these same herbes and you will access the wisdom. My deep truth is that plants are a spiritual practice. All the wisdom and healing that I would seek, is built in to the process work of the garden. It's all right at my fingertips. 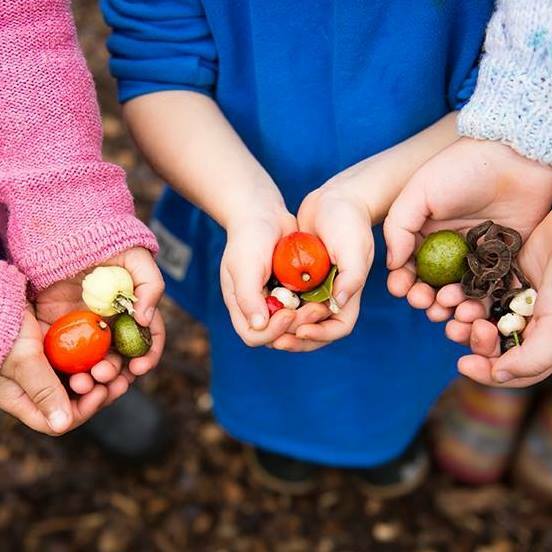 As provision and security, the garden is an act of wisdom for the next seven generations that is healing, powerful and continues to emerge. I'm mega-grateful for this work as an aid to unravelling the complexities of wisdom and vow and truth. The forgiveness process in the Swan Blessing is perhaps the most power-full. It's one thing to see your story. It'a another to let it go. Julia's skilled facilitation allows both in such a supportive and nurturing way. Truly, an edge walking Wise Woman! I like to call her Aunty Julia." 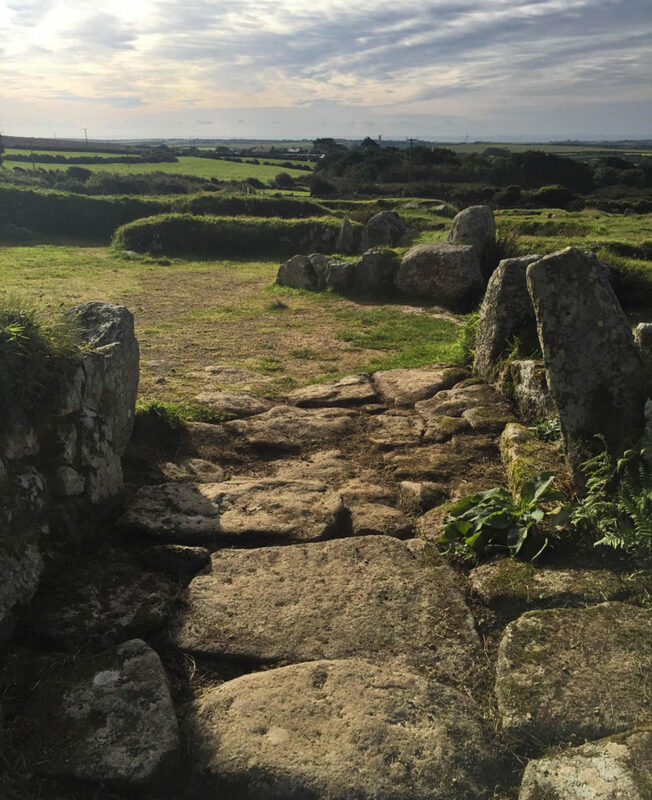 Today I share Becca's beautiful Swan Blessing story of 'the last town witch' and the freedom that comes from releasing an ancestral vow to keep medicine and old ways safe even if it means living a lifetime alone as 'the other'. "As I looked into the well, I saw the face of my mother’s mother - but different and older. She was afraid, telling me “They won’t believe me!” with such urgency in her voice. As we held hands, she bid me to enter into her life story. Suddenly I found myself in a town square with a well and horses and people bustling about. She was cloaked and asked me to quickly follow her to her home - outside of the main town in a hut with a leaking roof. It is rundown but this was the only place she feels safe. There’s a cat in the corner and fire in the hearth, with bottles of medicine and herbs hanging from the ceiling all around her. She is a medicine maker - making medicines to heal the women of the town who call upon her in secret during the day when the men are out. She goes to them and helps heal them, but there is a feeling of anger and resentment in her being. These women see her as other. They know they need her medicines, but don’t want to get too close or get caught being with her. She is the last town witch, and she is constantly in danger for what she knows. This makes her feel so sad and rejected, but she has made a commitment to the medicine and to pass it along. She made it when she was eleven to her nanny, who raised her and was a mother figure to her. Her mother was gone and her father was a powerful man with a bad temper and drinking problem that she felt she must obey. She and her nanny would play in the bath, putting flowers and herbs into each other’s hair. They would walk in the garden - the nanny teaching her everything she knew. And when she was eleven, the elderly nanny asked her to promise to preserve the mysteries and keep making and sharing the medicine. She makes this promise earnestly. When she is 22, she falls in love with a man who is equally in love with her. But he knows they cannot be together, as her father does not approve. He does not make enough money. So he leaves her behind - heartbroken and bitter, knowing she cannot disobey her father - she fears him and desires his approval. She is never to love or find companionship again. When her father dies suddenly, she buries him and then lives her life free and devoted to the medicine. But she is so so profoundly lonely - it aches her heart. She gets very very sick and almost dies. She has no one to care for her in her house at the edge of town. But, by the miracle of her medicines, she lives. This frightens the town and she is even more feared and seen as dangerous for her wisdom and healing magic. She is further isolated by this. When she is old, she discovers an abandoned baby in a stream. The baby is unwell. Even though she is old, she takes the baby in and nurses her back to health. The baby becomes her apprentice and is by her side as she dies. She dies still with the promise to preserve the medicine, even with the loss of her love and belonging in the town. She has kept her promise to her most beloved nanny. I feel the weight of this anguish - this vow to protect the medicine and be alone and isolated for the rest of her life. It is a boulder weighing down her heart and mine. I take this boulder and place it in my own chest to take it from her and ask her to forgive herself - she did the best she could. I am now covered in a clay chain making its way all around my body. The well witch appears and gives a hammer to break the clay. I smash down right over my belly and the clay slits into a thousand pieces - allowing the boulder to fall from my heart and become nothing at all. The well witch blows on my heart and seals the hole from where the boulder came from. She takes me into the water and lays me down where I float. All my grandmothers surrounded me in the water, blessings me with herbs and flowers and songs and ancient chants. I am free from this vow of loneliness. I am blessed to become all the light that radiates from within me. I rise up to become one with the sun above me- feeling the weightlessness of my soul self. The swan takes me upon her back and flies me back down to earth - to my home. I am free and joyful and home. I proclaim it 3 times. It is so." Last night I had one of the most profound journeys of my life thus far... in Swan Blessing, discovering through vivid story the source of my wounding and power. Today I share the Swan Blessing story of the Deer Healer and her exile by ancestral worker, artist and mythic storyteller, Lara Veleda Vesta. I was honoured to hold this ceremony for Lara as her ancestral work and teachings are so rich and deep and always an inspiration to me. I have no doubt that it was a Deer kinship that brought Lara and I together to do this work. The story of the exile is one that many healers carry deep in their bones. For many of us we carry ancient memories of the sacrifices that were made in the past around medicine and healing and the vows taken to have permission to carry it and use it. These vows made perfect sense in their time but they are very confusing for us to hold in our present lives. In past lives and in the times of our ancestors decisions had to be made to use healing medicine in a way that broke these laws but protected and saved the lived of others. These were extreme times and they called for extreme measures. What happens when the soul remembers and holds the trauma of these events? Very often these memories and soul promises activate similar events again in our current lives as the spirit tries to understand and heal this pattern. Lara's story is of a healer taught in a tradition of the Deer Women who had to break her healing vows to save the lives of her community. Rather than breaking the hearts of her people who looked up to her she chose instead to protect the integrity of the Deer Women and their ways by exiling herself from her home, her land and her people. In Lara's present life this story has kept playing out and only recently she experienced an illness and deep initiation back into this story. I believe that by cutting away these stories and histories we won't heal, instead we must let go of the ties and bindings to them through old promises and vows. In this way we are not cutting off we are integrating the story and coexisting with it. We can then learn to embrace the teachings and most importantly the deep ancestral wisdom and medicine ways of these times. This is the 'coexistence of alchemy'. This is our inheritance. And this is Lara's Swan story. And I bathed in the pool by my grandmothers who dyed me with woad and garlanded me with bay laurel and rosemary and hawthorne berries and star bright flowers and sang to me and set me free to run with the deer beneath the sun, with the swan singing and my own voice singing and opening to the freedom that is our birthright, I return the song, I return to the women of the deer, I carry them with me. Their freedom, their healing, their community, their belonging, their land of oak and meadow, their scent of blood and bone, ash and stone. We are one. 'In the ancient time of swan and wind there lives an undine. She waits not, for in the portal of the waterfall pool she drifts up and holds my hand. Her crown sways, her eyes portals too, slits of pure gold and grace. The silver thread around my finger connects to her webbed hand, her skin ever changing aquamarine, deep blue, green. We fall into the pool and are in the creek of my childhood, the water warm, stones brown and copper bronze beneath us. On the floor of the creek there is a golden key. The undine has me take the key in my right hand and swims us deeper along a dark channel where there is a narrow passage with a round wooden door. Looking up I can see the blurred alders above and remember I can breathe underwater. I insert the key in the lock and turn and the water rushes out into a meadow. In the meadow sits an old woman on a stone in a circle of stones. The circle is surrounded by oak savannah and rolling hills. She is crouched there wearing a red skirt and a green shawl, her hair long and silver grey, her face pained as she looks down the valley. Her heart hurts, there is a pain too deep to skillfully bear. Down the valley in her line of sight, through the portals of time to a village. She is young there, wearing a skirt of red and a green embroidered vest with silver clasps, her hair in a long braid. On the town green there is a festival starting and she has the work of strewing the flowers and herbs, blessing the circle. The townspeople love her and honor her. She feels whole. To the north of the square is her home, a round house with two levels, a fire or hearth in the center. On the fire is a cauldron, and in the cauldron is a medicine brewing thick with herbs, purple in color. She adds a handful of hawthorne berries and stirs the mixture. A spiral forms on the surface, doubled, moving in both directions. She sips from a heavy cup and it tastes of honey as the door opens. It is her work today. She heals hearts with this medicine, scooping it cheerfully into cups, offering herself in story. Literal hearts, broken hearts. Her work is love and joy. In the forest, but not far from the edge of town there lives her teacher. At six she was sent for initiation and study with the woman of the deer. The woman of the deer is sometimes many women, sometimes one. She has long white hair and wears white robes, and the deer around her round house are dappled white. Something shines in her hair, something like stars. The girl learns the ways of the deer, learns when to pour out and when to conserve. There is a sacred knife stuck into the table block and she watches it for many years, through growth and learning, until her moon blood comes. One night when the moon is just past full she is taken into a field and her left hand is cut by her teacher down the palm, her blood dripped into a cup in the stone. She makes a vow by her blood to serve always and without question, to preserve life and to listen to the deer. She is celebrated, she has her purpose and her path, and the women of the deer live on for another generation. Sometime in her mid life a moment of choosing comes. An aching betrayal. The village suffers abuse and violence, destruction, a year without crops, another, the deer are dying from lack of fodder in the hills and the people are dying from the greed of men. The greediest and cruelest of all lies before her now. A shadow. She carries a vial of poison. To end his life is forsaking her vows, but to not end his life is forsaking her community which she has committed to serve, the land which she is promised to, the deer to whom she owes her spirit heart. If he doesn’t die all of this will be gone. And if he dies at her hand she will save it, though she must die too—at least, appear to. She must disappear into the wood and not return. She will leave her cloak in the stream, smeared with blood. They will believe her victim of another’s crime. This she knows and still tips the bottle to his blistered lips. Then she goes. Run run run. Run with the deer. In exile, she can’t ever return. No one knows, it is a secret. She lives alone, serving only the deer, healing the deer. She dies in the circle of stones, still bound by her oath and the complexity of the forsaken. And her oath became mine. To serve without question. Her choice became mine, to lose and lose again home and root and family. When we met she was all ages, ever changing. When we embraced she was so familiar. She smelled like me. The binding on me was wood and metal, like a barrel and staves with a lock. She drifted into wholeness, becoming our whitehaired teacher, woman of the deer. And the water witch in the falls gave me a glowing wand which sliced through the past, the broken oath, the exile, like liquid and the bonds slipped away. You can explore more of Lara's profound work in ancestral mythology guided by her Norse ancestors at Lara Veleda Vesta. I hope her generous offerings, experience and wisdom help you to find the trackways back to your own ancestors. ** Two days after holding Swan Blessing for Lara I went for a walk in Sherbrooke Forest and finally saw the White Deer that lives here. I have been waiting 5 years to sight this beautiful creature that I had heard so many stories about. This was a beautiful confirmation that by connecting with others who carry similar medicine and dreaming that we strengthen our dreams and wishes. Thank you Lara for helping to sing the Deer back to me. "I find myself in a forest I recently visited in a blood vision. Cool, dark, green. A sacred place of my ancestors. A path between the trees. A feeling of longing washes over me so deeply that it registers as sorrow. A longing for this place and it's longing for me. A longing for this home that I once knew I belonged to. Every part sacred to me and I sacred to it. I find myself at the pool from my last vision. Dark water, a bottomless pond surrounded by women in the tree shadows. Surrounded by trees with arms, voices, faces. In the surface I see a woman. An animal head covers hers and she has a cloak of skin and feathers. She has deer antlers and a face that looks part human, part animal. She reaches her hand out and draws me in. We swim down into the dark pool and it becomes the sea of All Memory. We continue deeper until finally we are back in the same woods I have been walking in above. I am following her from behind. She takes me to her home which is round. In the center is a stone circle with a fire and big round pot with a spiral carved on the side. There are work benches with boards and knives, bunches of dried plants hanging. A sleeping area on the other side piled with furs. She lives here alone. She is a plant healer. People come to her for healing and they feel respect and awe for her. I can see her face now and it has ochre coloured tattoos on it. Lines and spirals and dots. She has bushy eyebrows and long greying hair, about 50 years old. I feel her sadness and her longing too. Or is it mine? The sadness and longing for this place echo off each other, a mirror image. I am now being shown how she came to work with the plants and know their medicine when she was younger. I see her with her ear against the earth, listening. Her ear against the trees, listening. They are teaching her directly. There is no mentor. She just listens to the forest speaking. She has chosen a solitary life to be out here listening and working with the plant medicines. I see her stretching her hands out towards plants and they are speaking. Between her hands and the plants, spiralling on currents in the air, are symbols and codes written in a bright bluish green that is almost white. This is how they talk. She is walking through the forest in a wash of these swirling symbols, speaking, hearing, knowing, light, safe, joyful, fully absorbed in her work. There is nothing else for her to do but this. I feel rapture and contentment. Then I see her inside her hut and there is a bag around her neck, a little pouch of yellow flowers. They are being driven into her heart, absorbed by her body. I then see that men are there that she doesn't know who are strangers to this land. They have metal on them, helmets. People of this land do not have metal garments. They have come for land and they know that killing her is like plucking out the heart of the people. One has blue eyes, trimmed beard and light blonde hair. My stomach churns to think about it. He is holding a knife to her chest, an old hand-wrought triangular blade. He slits her throat. She falls to the ground. I am crying, tears running down my face. Next, I am standing with this woman, with her spirit, after all this has happened. Our hearts touching, our beings so very close as to almost lose the notion of skin. I give her my love. I sing to her and she sings to me. And she becomes lighter and lighter and is free, flying away above me. I am left standing there knowing that I am different because of this and that this has always been so. I have vowed to be quiet. She never spoke when they came for her. I can feel this vow in my clenched jaw and my grinding teeth. I see living vines wrapped around me, growing up from the earth and binding me in silence. They swallow my head and face and I am as quiet as the forest has now become. No one to hear the swirling light language. With the forest listener murdered, all has fallen silent. Crouched, hidden, unsafe. She comes back to me, holding the knife that slit her throat. She has wrapped it in cloth and sprinkled it in herbs. She wants me to use it to cut myself free. But I don't want to use this tool of murder, I don't want to harm these living vines that protect and smother me. She rattles over me and holds out the knife, laying a hand over mine as we make one cut together, near my throat. All the vines unravel, twirling and unwinding in the air as my being becomes larger and larger and fills with light. Light is rushing through my being and I am more light and energy than form. The form I see is a kind of cross shape overlaying my body. My tree grandmothers around the pool from the beginning are now singing over me to heal me. I fly up to the sun and everything is burnt away - my body, thought forms and my pain. All that remains is spirit which I see is a swirling constellation of the symbols the plants spoke to me in. That is all I am. It feels so good to be this pure essence. I find that I am at the edge of the forest on the shore of a moon-lit ocean. I am receiving the blessings of the oldest grandmother. It is then that I see that the ocean is the repository of all the symbol language. It holds all the songs, all the whisperings, all memory. I see myself in the waters, leaping through the surface, singing this language. A name comes to me. I am Sea Singer. When I sing this song, I am signing the oldest song and it connects me to the memory of all things. All life comes from the sea and she remembers all her creatures, even those who now walk and grow on land. I can see the sea song swirling through the waters, running through my body and out my lips, blowing through the forest and forming the great constellations above. The pattern of life giving rise to all things. I felt my connection to this woman was past life but it felt so far back that it overlapped with my ancestry. The knowing I received from the sea song was that in the sea of All Memory, we are emanating from this collective of spirit and blood, the white and read threads. They are the two strands of my DNA that give rise to my form. I saw this as a double helix traveling up my spine giving me my body and being. The sea song is my spirit song. It animates all of existence and all life is constantly singing this language. As I learn to let it flow through me, I will be able to hear it, to learn and remember all I need to walk my medicine path. I'm so glad that Phoebe has let go of this old story and past life vow to be silent, she not only found her voice, but found her song as the Sea Singer. Read more about Swan Blessing past life and ancestral journeys.